Leli Dratta is a registered nutritionist specializing in diabetes and food allergies. He is also the co-author of several health-related e-books. Dratta holds a Bachelor of Science in biology and chemistry, as well as a Master of Science in human nutrition. Grape juice is obtained from grapes. As they come from the same source, grape juice and wine share many health benefits because they both contain a number of health-boosting nutrients. The main difference, of course, is that wine is fermented and contains alcohol. Grape juice can be made from all types of grapes, but is usually made from "table grapes." These are seedless and are larger than "wine grapes." 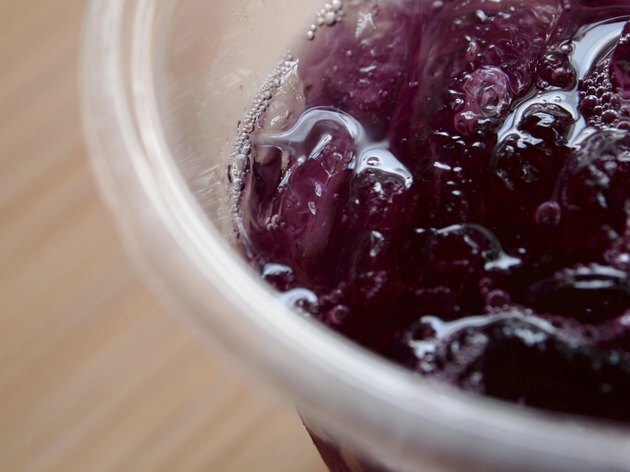 Remember that like all juices, grape juice is a source of sugars and calories. Consume it in moderation. Grapes contain polyphenol compounds that exert antioxidant and anti-inflammatory actions. These compounds are also present in the juice. The March 2010 issue of the “British Journal of Nutrition” reported that grape juice consumption for 12 weeks improved cognitive function in older adults with early memory decline. The study found no changes in weight or waist circumference following juice consumption. Further research is warranted to investigate these neurocognitive effects. Subjects given 5.5 milliliters of grape juice per kilogram of body weight daily for eight weeks exhibited a significantly reduced blood pressure, reported the 2004 issue of “Biofactors.” The decrease was 7.2 mm Hg for the systolic blood pressure and 6.2 mm Hg for the diastolic. The researchers attributed this to the grape’s polyphenols, which are known to exert platelet-inhibitory and arterial-relaxing effects. A study reported in the July 2006 issue of the “American Journal of Clinical Nutrition” investigated the effects of drinking concentrated grape juice for two weeks on cardiovascular parameters of both healthy subjects and subjects on hemodialysis. It was found that in all subjects, low-density lipoprotein cholesterol decreased while high-density lipoprotein cholesterol increased. The former is associated with an increased risk of heart disease, while the latter is associated with a lower risk. In addition, oxidized low-density lipoprotein cholesterol levels were reduced. This type of cholesterol has a very high propensity to cause atherosclerosis. Consuming antioxidant-rich food and beverages, such as grape juice, can help to maintain clear and youthful skin, reports the book “Medical Herbalism: The Science Principles and Practices Of Herbal Medicine.” Antioxidants protect your body against damage by free radical molecules. Such damage is associated with chronic conditions such as heart disease as well as age-related changes such as wrinkles and skin tone deterioration. Does Cranberry Juice Make You Lose Weight?